Light Meets Luxury. 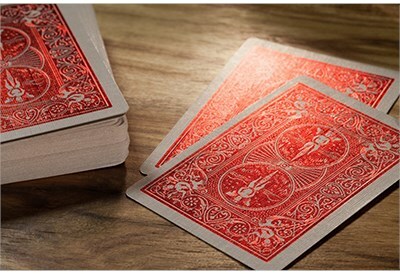 Exclusively from The United States Playing Card Company, the proprietary MetalLuxe™ technology gives these cards ideal flexibility and durability equal to a standard Rider Back card. Stamped with real metal to achieve a dazzling shine, each MetalLuxe™ card showcases brilliant luminescence and color. Printed on premium cardstock, this deck features the brand's classic Air-Cushion™ finish to ensure long-lasting, flake-free performance. Made in the USA. Also available in Golden Luxe and Cobalt Luxe. 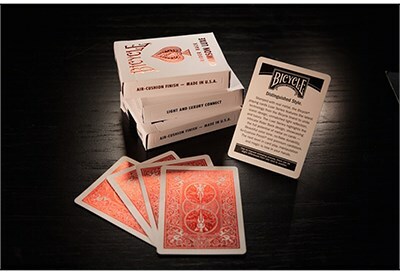 Using a premium matte white card stock, the tuck case showcases the standard Rider Back tuck case design through subtle embossing and debossing in the card stock. 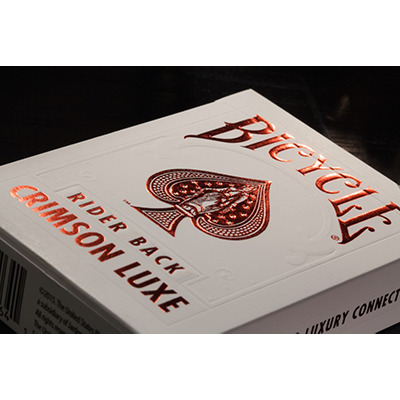 The tuck case also features embossed elements of vibrant Crimson MetalLuxe™ technology; including the Bicycle® logo, Goddess of Liberty Spade, card back design and other deck information around the edges of the tuck. The inside of the tuck features a fully coated, luminous Crimson MetalLuxe™ finish.